The negative relationship between unemployment and earnings growth seems to hold across states. The U.S. labor market has substantially recovered from the effects of the recent recession. The unemployment rate has dropped from 10 percent at the end of 2009 to 5.5 percent today, a level Federal Open Market Committee participants consider close to its long-run value.1 Although the current economic expansion widely improved labor market conditions, there is some debate about whether these improvements lead to higher wages.2 In this essay, we review the relationship between wage growth and unemployment. The Phillips curve is often studied at the national level; however, not all regions experienced the recent recession and subsequent expansion in the same way. Unemployment in some states reached almost 15 percent, while in others it remained around 4 percent during the worst of the recession. Given this disparity, wage pressures can be expected to evolve differently in different areas. An examination of wage growth and unemployment data on a subnational level reveals interesting variation and helps identify a Phillips curve relationship even for short periods of time. The left panel of the figure plots the Phillips curve for the 50 states from 2008 to 2013: Each point represents a year-state combination, with the year-over-year growth in nominal earnings on the y-axis and the yearly unemployment rate on the x-axis.4 The shape-color combinations of the points represent three different periods, with two years per period. (For example, green diamonds are used for both 2008 and 2009.) As the data show, the negative relationship between unemployment and earnings growth seems to hold across states. Economic research suggests that not all wages react the same way to economic conditions and wages of new hires may be more sensitive to the state of the labor market. The intuition is that, in a tight labor market, workers have more employment options and firms desiring quality workers must offer high wages. The right panel of the figure includes earnings of new hires only rather than all employees.5 Although the negative relationship between unemployment and earnings growth does not seem as strong, in part because of higher volatility in the year-over-year earnings of new hires, it holds nonetheless. Both panels suggest that wages tend to respond to conditions in the labor market and to the unemployment rate in particular. Since labor markets in the United States have substantially improved and are expected to improve even more, it is likely that nominal wages will increase at a faster pace. 1 In March 2015, members of the Federal Open Market Committee (Board of Governors of the Federal Reserve System, 2015) forecasted unemployment to be between 4.9 and 5.8 percent in the long run. 2 From 2010 to 2014, average hourly earnings of production and nonsupervisory employees increased about 2.1 percent per year, compared with 3.2 percent per year from 2004 to 2007 and 3.6 percent per year from 1995 to 2000. 3 In particular, the Phillips curve should not necessarily be interpreted as a causal relationship, and it may vary with changes in the economic environment. 4 The state-level unemployment rate and nominal earnings data are from the U.S. Census Bureau's Local Area Unemployment Statistics and Quarterly Workforce Indicators, respectively. The earnings data are reported quarterly and averaged to calculate year-over-year percent changes. The monthly unemployment data are averaged to an annual frequency. 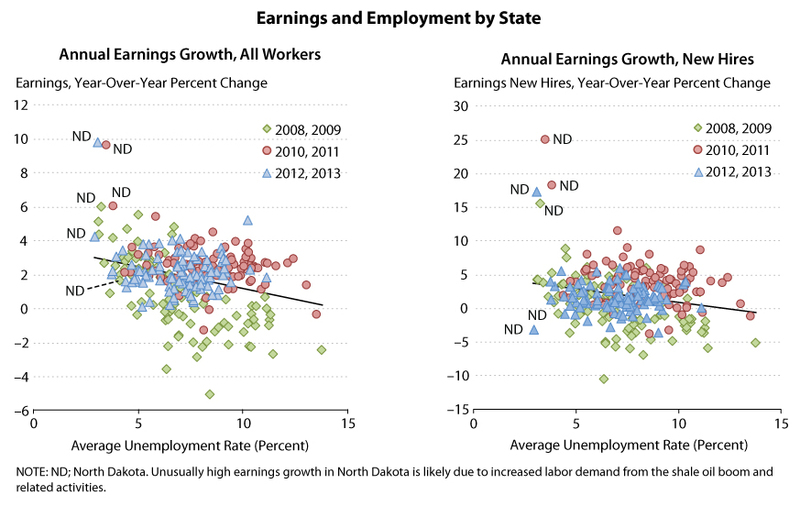 Earnings should be interpreted as the yearly percent change in average earnings for the state. Earnings may change because total hours worked change and/or wages change; we cannot distinguish between the two in these data. 5 New hires are workers who joined a firm and are calculated by quarter. These workers may have been previously employed or unemployed. Phillips, A.W. "The Relation Between Unemployment and the Rate of Change of Money Wage Rates in the United Kingdom,1961-1957." Economica, November 1958, 25(100), pp. 283-99; http://www.jstor.org/stable/2550759.